The four chicks being foster-reared in Gianna’s nest-box. Photo by Liz Corry. 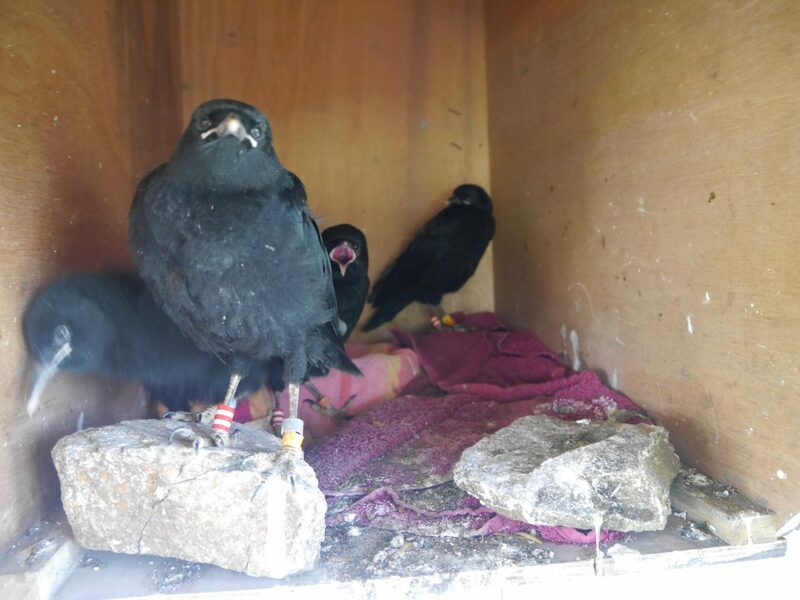 At the end of May the four hand-reared chough chicks at Durrell were transferred to Gianna’s nest-box so she could help feed and look after them. We moved them in once they reached five days-of-age. Since they hatched on different days it meant the moves were staggered. This probably helped Gianna as it meant she went from having four eggs to one chick and three eggs, followed by two chicks and two eggs and so on. We continued to feed the chicks five times a day whilst making sure there was enough food for Gianna to cover the other feeds. The Go-Pro video below gives you a close up insight into feed times in the nest. Normally once the chicks start to open their eyes we start wearing a black glove and feed with red tweezers. A poor imitation for a chough, but it seems to help the chicks. It means that when they are older and out and about at Sorel they are still going to be wary of people. We faced a problem with our ‘no glove, no love’ policy this year. Gianna hated the glove. Gianna in front of her nest-box with four hungry foster chicks inside. Photo by Liz Corry. For some reason she took great offence and would attack your hand or even just the glove if it was left on the food stand. 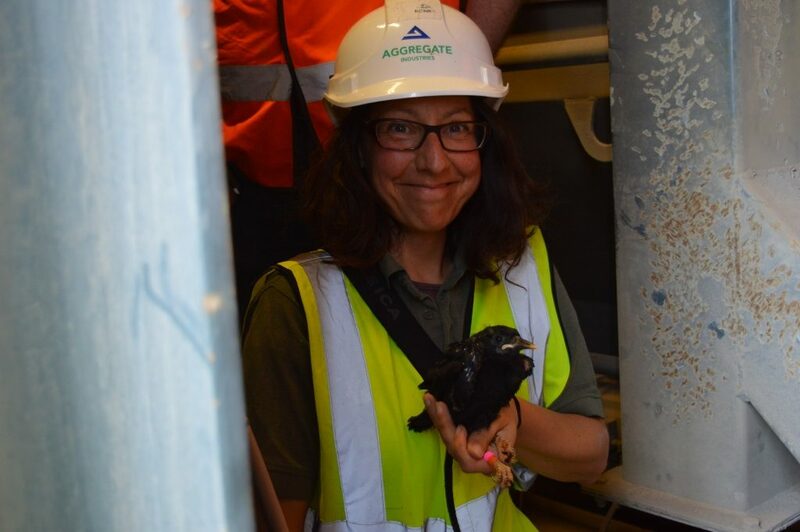 She was the same with the latex gloves we had to wear to take DNA samples from the chicks. We tried to be secretive about using the glove, even tried distraction tactics with a second person preening Gianna. However, she quickly wised up to our actions. As the chicks grew and developed we reduced the amount of feeding we did and let Gianna do the majority of the work. We regularly weighed the chicks to make sure they were progressing well. The video below demonstrates how we weigh them and more importantly how attentive Gianna is, not to mention how comfortable she is with what we have to do. Apart from the initial settling-in period as mentioned in May’s report the chicks seemed to have no issues. At three-weeks-old we added leg rings, took measurements, and DNA samples for sexing. 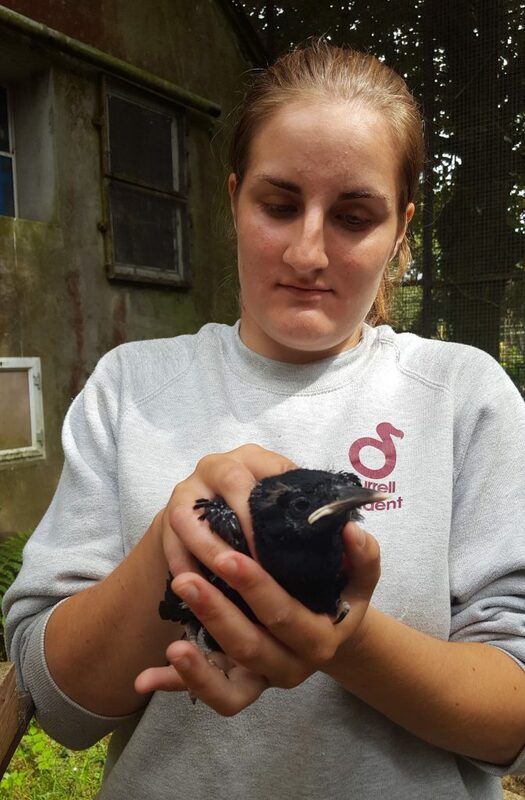 Student Bea holding a three-week-old chough chick in preparation for leg ringing and DNA blood sampling. Photo by Liz Corry. Flight feathers emerging on the young chicks. Photo by Liz Corry. We started to notice the younger chicks had feathers missing. It was subtle at first since they were still growing feathers and had naked areas. Very quickly it was clear that Gianna was too attentive, she was feather plucking. She had shown signs of this with the chick she foster-reared last year. Back then it was only the small feathers under the chick’s chin and it stopped once he had fledged. This year she had intensified and focused on the wing coverts. The chicks in themselves were fine and she was still feeding them as normal, but we couldn’t leave them in there until post-fledging. Birds without flight feathers don’t tend to do so well when released into the wild. It meant we had to move the chicks to Sorel earlier than planned and take back full responsibility for feeding the chicks. Gianna was not too pleased and took a day or two to adjust. The chicks, however, coped really well. 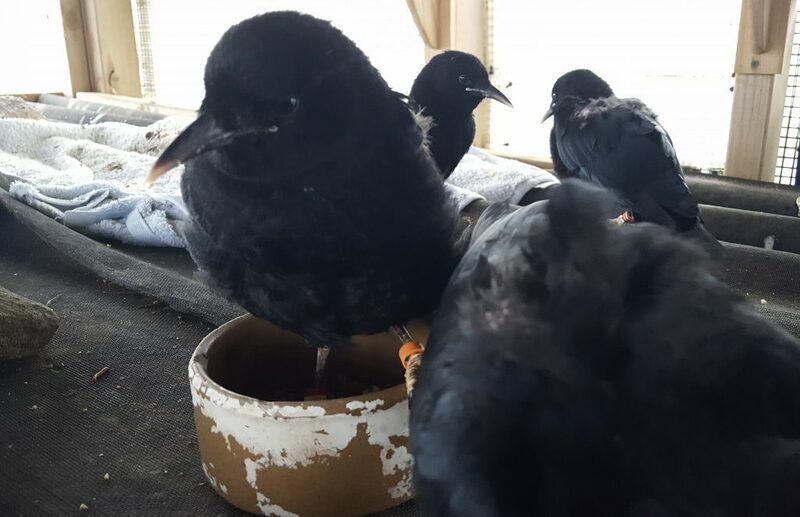 They settled into their new surroundings locked away in a nest-box in one section of the aviary. 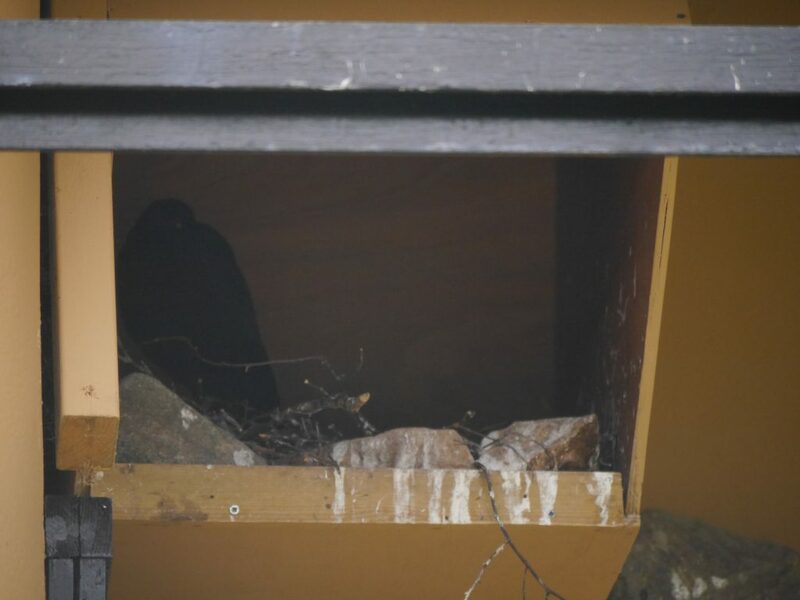 Panoramic image showing the nest-box (right) in the release aviary and the section where the chicks will be kept separate from the free-living choughs who still use the poly-tunnel. Photo by Liz Corry. 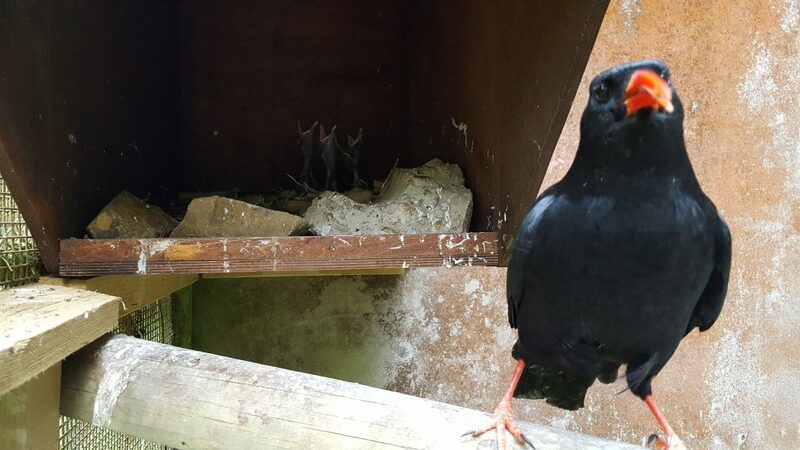 The oldest chick could be heard calling in response to the free-living choughs when they showed up at the aviary which was a positive sign. We immediately started using the black glove and red tweezers for every feed. 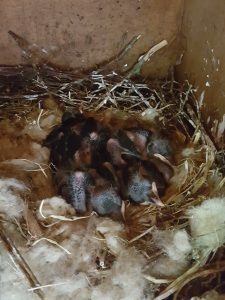 The foster reared chicks in their nest-box in the release aviary. Photo by Liz Corry. The chicks very quickly started to behave and look like proper choughs once they were five weeks old. The oldest chick, known for now as Chick U, would come to the front of the nest to try and beat the other three to the food. 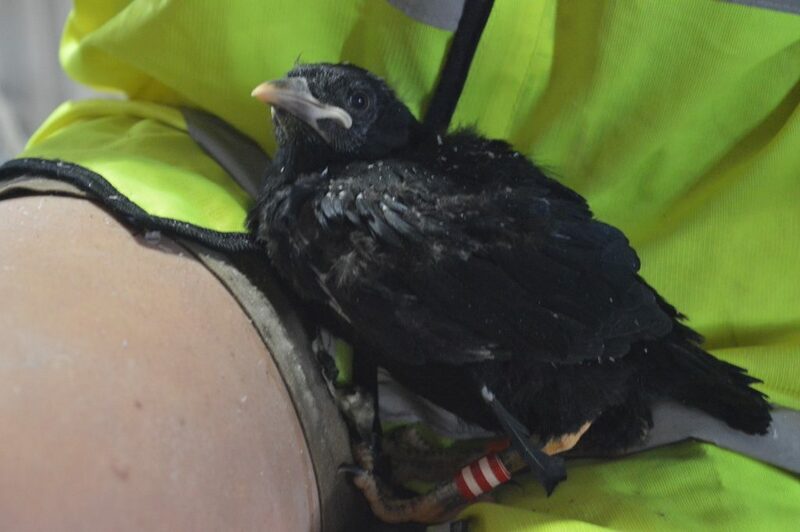 Chough chicks start exploring their nest site around four to five weeks of age. Photo by Liz Corry. Understandably U was also the first to leave the nest on 30th June. U jumped out to the shelf were the pot of food was and begged to be fed. Once it realised the other chicks in the box were still getting food it jumped back in. Chick U was very quickly followed by the other three on the same day. Their motivation to leave was completely food driven. As soon as I arrived with the food at 07:30am U jumped out to beat the queue. By the afternoon feed Chick W had realised U’s game so jumped out behind and within seconds the other two, Chick X and Chick V, took a leap of faith in despair that they might not get fed otherwise. 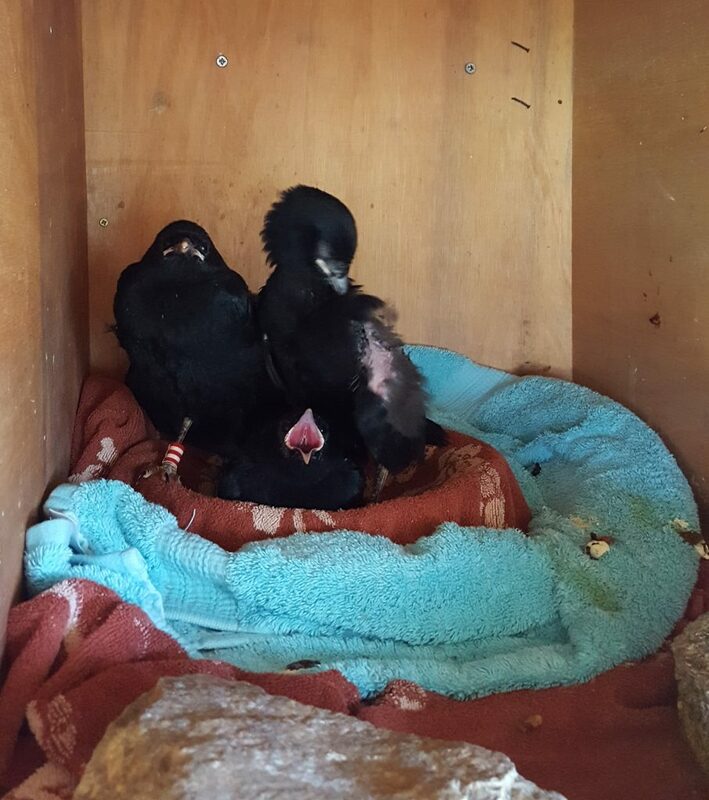 Captive chough chicks out of their nest. Photo by Liz Corry. Now feed times are slightly chaotic as we have mobile begging chicks and everything is new and of interest to them. From their first water tray to small things like screw heads in the aviary timber. They won’t fly much just yet, its all about jumping and walking and occasionally misjudging and tripping over. 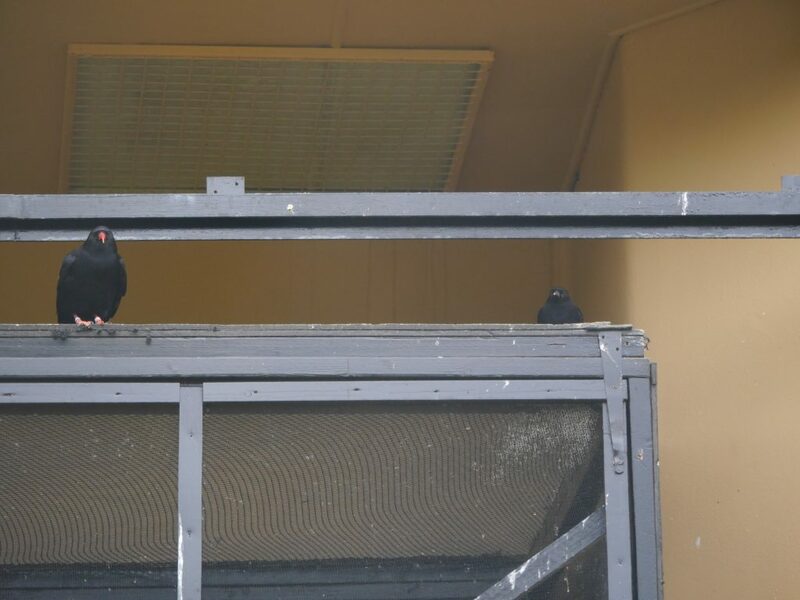 They are taking a real in interest in the free-living choughs on the other side of the mesh. This is obviously very advantageous for when they are finally released and mix with the group. They will be learning about the social structure of the group and observing all their behaviours. Hopefully becoming less dependent on staff, but still comfortable in their presence to make management practices easier. Next month they will be joined by the parent-reared chicks from Durrell. Another new learning experience to embrace. Tristan with one of his two fledged chicks at Durrell. Photo by Liz Corry. 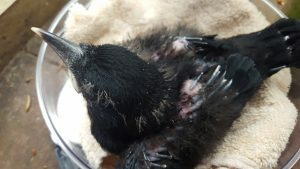 Chough chicks have a habit of jumping out of the nest at six-weeks old to explore and feed then going back inside to take naps during the day. Photo by Liz Corry. 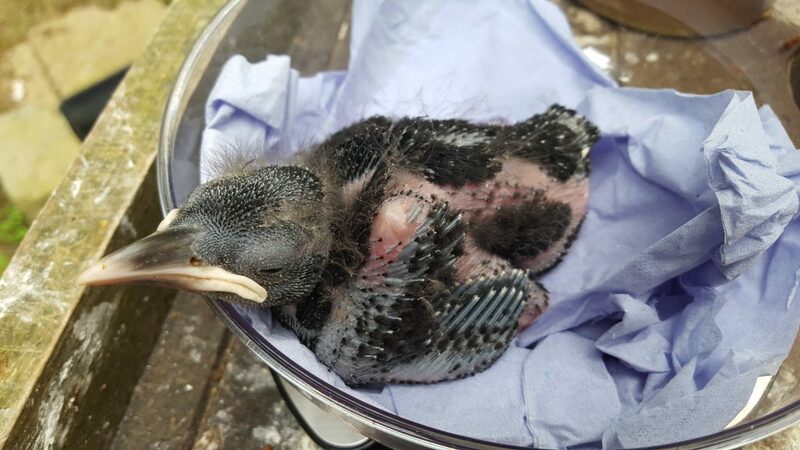 Chicks S and T took their first brave steps out of the nest-box back at Durrell this month. The proud parents stuck close by their chicks. One chick didn’t take to outdoor living as much as the other and went back in the nest for a bit. Visitors at Durrell will only have a short window of opportunity to see the family out and about in the aviary. Once the chicks have started eating for themselves they will move to the release aviary and start socialising with the foster chicks. One of the parent-reared chicks having just left the nest at Durrell. Photo by Liz Corry. The chicks in the wild nests have also had an momentous month. At the start of June we made the visit to the nest sites to ring the three-week-old chicks. Glyn and Bea were joined by Channel Islands ringers Dave Buxton and Cris Sellares. Donned top-to-toe in industry standard PPE they ventured down into the quarry. The first nest site they visited belonged to Red and Dingle. When we checked in May they had two chicks and much to everyone’s relief they still had two chicks. Except much bigger and a lot noisier. 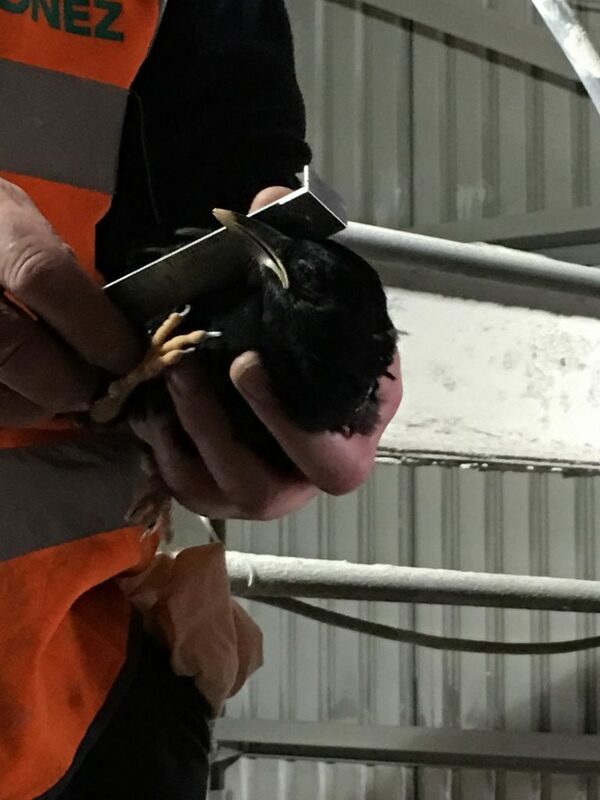 Chick PP004 from Red and Dingle’s nest being fitted with a metal leg ring. Photo by Bea Denton. Each chick was fitted with a metal Jersey leg ring, colour plastic rings for quick visual identification and had leg, wing, and weight measurements recorded. Small samples of blood on blotting paper were taken for DNA sexing. We should know by July which are male and which are female. Cris Sellares with chick PP005 sporting pink and orange leg rings. Photo by Bea Denton. Next was the turn of White and Mauve. They also had two chicks the last time we checked and two unhatched eggs. We are pleased to say both chicks had survived. As expected the two eggs had failed and the parents had removed them from the nest. Chick PP003 having it’s wing length measured. Photo by Bea Denton. One of these chicks proved to be a little tricky and lost a claw. 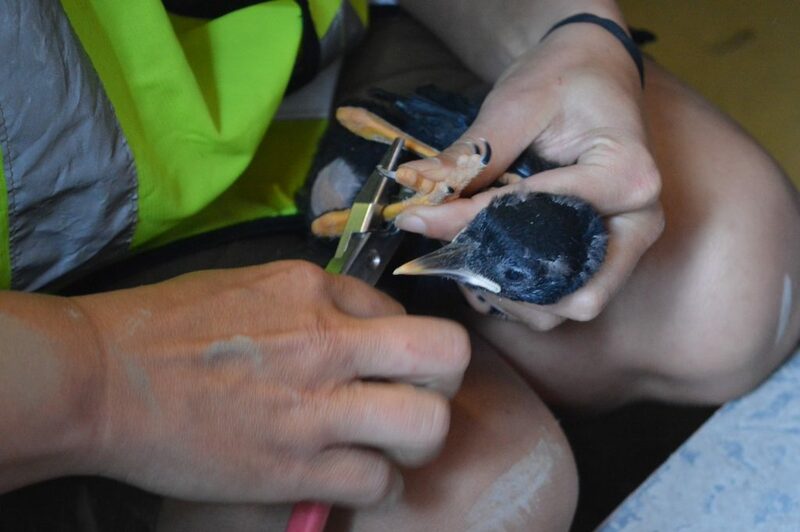 A spot of super-glue was applied to stop the bleeding before it was placed safely back in the nest. Chick PP002 sporting its new red and white striped leg ring to let people know it hatched in Jersey. Photo by Bea Denton. The last nest to be visited was Green and Black’s who actually started nesting first out of the three pairs.We could not reach their nest last time, but had heard a chick or maybe two chicks begging. This time we were told by a member of the Ronez team that a chick had been seen on the floor of the building a day or two before. The ringing team searched the area below the nest. Glyn found several pin feathers on the floor. The nest was eerily silent. With very little to go on and no access to the nest we do not know if the chick fell out and died or had died in the nest and the parents discarded the body. The feathers could be a result of predation, but did this happen before or after the chick had died? Green and Black have not been behaving any differently around the aviary. They still showed up for food and had continued to fly back towards the nest site with food in their bills. We continued to monitor them all month and nothing changed. We may have given ourselves false hope. Did the nest have two chicks the first time we checked? Has only one died and the parents are still feeding a second? We will have to wait until after fledging to see if Green and Black are indeed feeding an unringed chick. The wild chicks were due to start leaving their nest in the last week of June. From the behaviour of the parents we think this happened. However, with the persistent rain and fog there have not been many nice days to emerge from the warm, dry buildings and properly practice flying for the first time. Watching the quarry to spot the first signs of fledglings. Photo by Liz Corry. We have been very grateful to our old colleague Paul Pestana who has volunteered his time to help watch the nest sites. Combining all our observation notes we think we have exciting news for the July report. Green and Black’s nest was not the only mystery at the quarry this month. 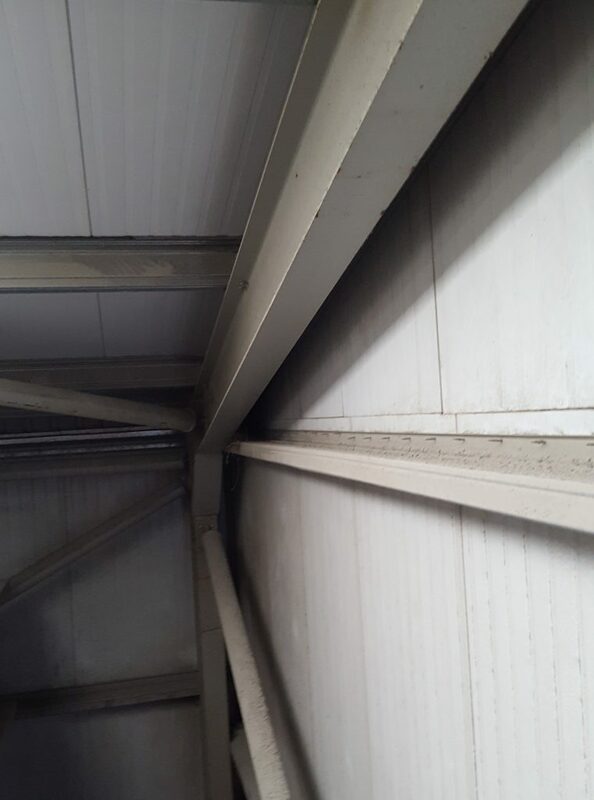 Shortly after the visit to Ronez I was contacted by Robin Jenkins to say that one of his site foremen had spotted a nest in another building. 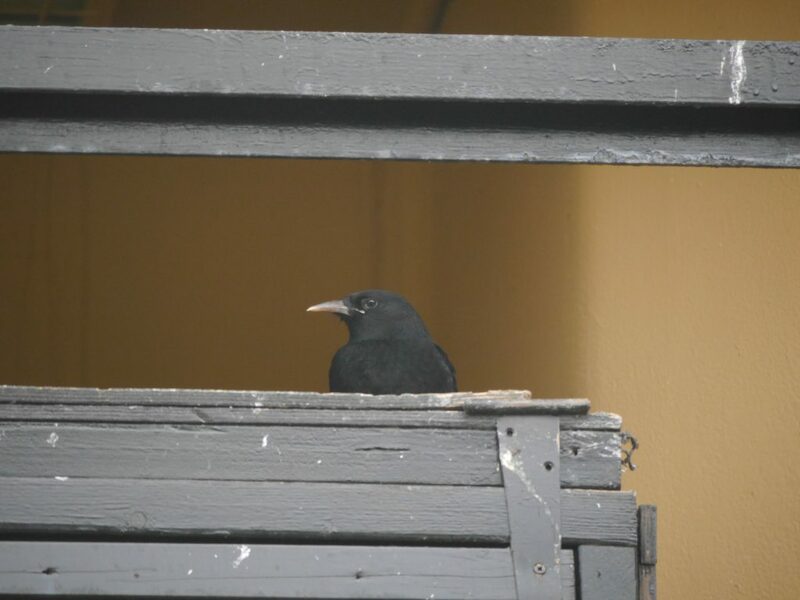 He had noticed it because the building is regularly used by a few choughs as a roost site. I went up at 6:45 am to check it out before the machinery was switched on. There were no choughs to be seen or heard. However, there was a nest! Trying to look into the nest with a Go-Pro on a fishing rod let me down once again. This time because the camera has no light attached. Torchlight was only possible side-on. There were no sounds coming from the nest in all the time I was there dangling a camera above the nest. 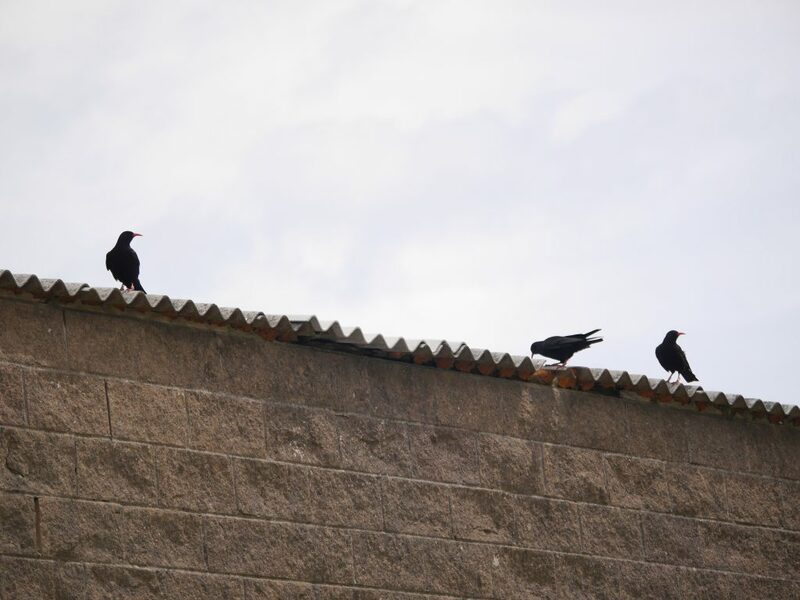 However, there was fresh evidence of choughs using the building. I suspect an inexperienced pair attempted to build a nest. They might have stopped at the nest building stage. We don’t know if the nest is lined, it could just be made of twigs. A return visit to the quarry at the weekend when everyone had gone home answered one question. The birds using the building were Egg and Chickay who are two-year-old females, one parent-reared, the latter hand-reared. And the male they are partnered with is no other than our infamous wild-hatched chick Dusty! Chickay (left) with Dusty and Egg appear to have found their own corner of the quarry to set up home. Photo by Liz Corry. The trio then added to the list of questions by disappearing into another restricted access building with food. From our observations we know they regularly take food back from the aviary to the quarry. Neither female has shown signs that she is/was incubating. Are they just caching food away from the other choughs? Is this what Green and Black are doing? 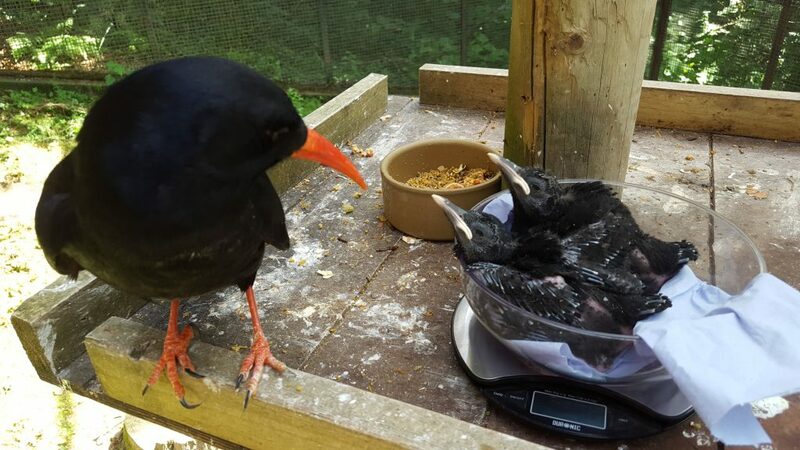 All we can do is keep monitoring the choughs and keep a lookout for any unringed juveniles being fed at the aviary in July. Less of a mystery is why the sheep at Sorel have gone from being cream coloured to brown. Its sheering season. Time to throw off their winter coats and prepare for a sizzling hot summer. Any volunteers willing to knit the sheep coats whilst they wait for summer to show its face please contact the shepherd. The flock was temporarily locked in the aviary field and adjacent field whilst Aaron and Ewen processed them all. The sheep had a field day (pun intended) eating their way through the long grass. It is now at a height perfect for chough bills to start foraging for insects. 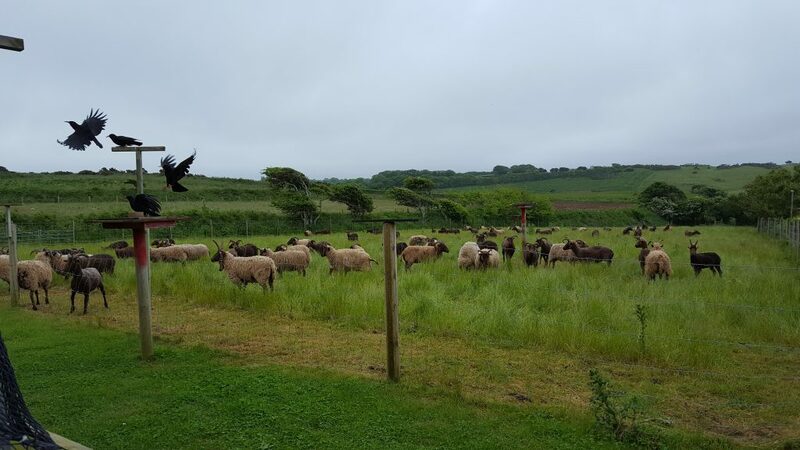 Towards the end of June the sheep moved back onto the headland where they are free to roam and continue working on restoring the habitat. 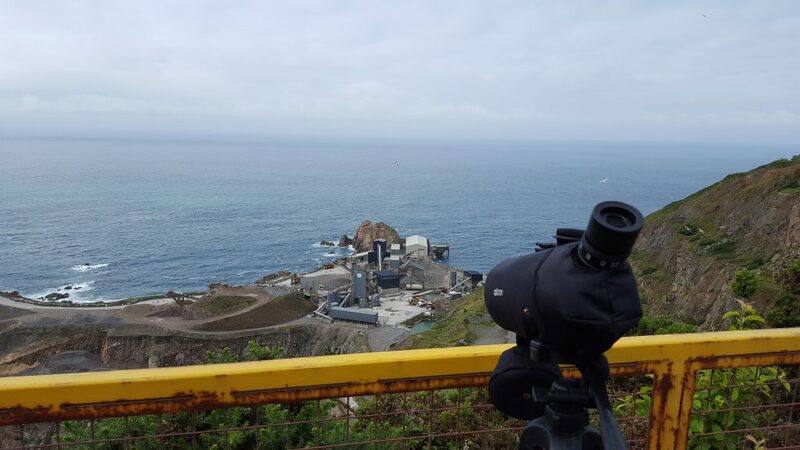 The 2016 Collas Crill Island Walk with the Rotary Club de la Manche was held on 18th June. 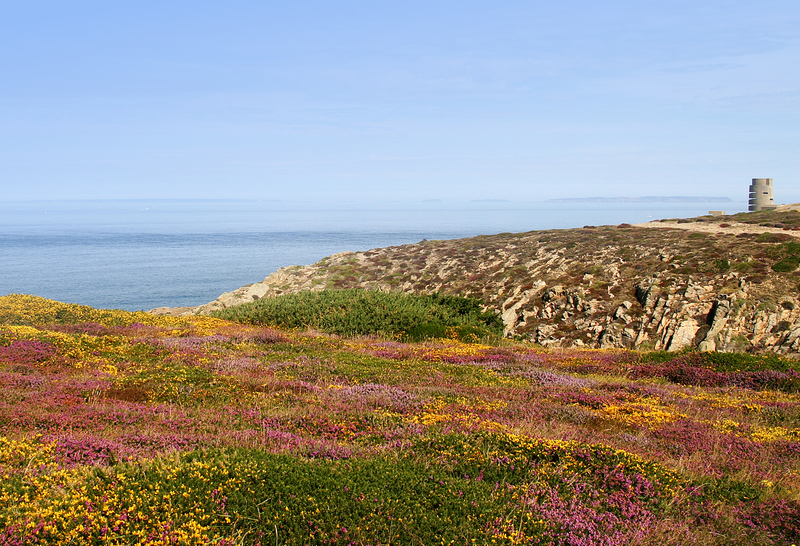 Inevitably the 48-mile round-the-island route includes the clifftop home of the sheep and the choughs. We were delighted to hear that Durrell are one of the many local charities who will receive money raised by the several thousand participants. Durrell will put these funds directly into the running cost of the chough project for 2016. 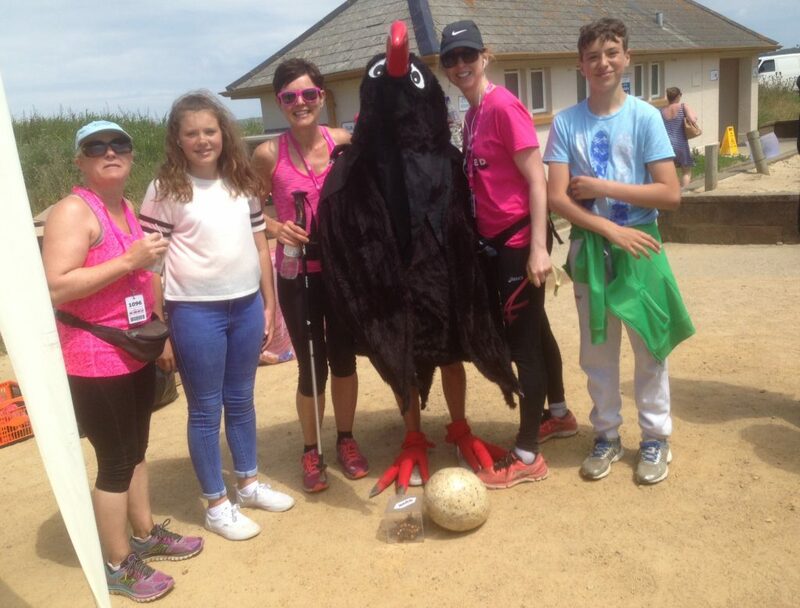 As a small way of saying thank you Caûvette the chough made an appearance at the Le Braye section of the walk to lend her support. Many thanks to Sarah Nugent for ‘transporting’ Cauvette to Le Braye. Just a few of the 20, 000 plus participants of the 2016 Collas Crill Island Walk. Photo by Sarah Nugent.